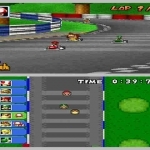 A large collection of cheats for you to check out and include unlocking bonus karts and level 7. We've also got the Sky Garden shortcuts. We've got hints and tips that include getting all the Retro and Nitro cups and courses. There's also cheats for getting all the characters and Battle mode stages. We have 347 questions and 865 answers for Mario Kart DS. Check them out to find answers or ask your own to get the exact game help you need. Can You Still Play On Nintendo WFC After shutdown? R4i SDHC Gold Pro 2016 ar code not working! We have 14 Walkthroughs for Mario Kart DS. A huge collection of walkthroughs and FAQs that include a Battle mode guide, game mechanics FAQ and an anti/shaking FAQ. There's also a character and kart guide. 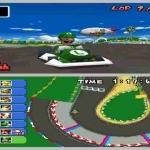 16What is your favorite character/kart combination? Mario Kart DS is Mario Kart on the Nintendo DS. 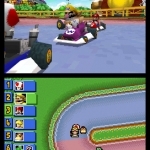 It is a very good game and a personal favourite of..
Mario Kart DS is the only Mario Kart game for the DS thus far. It offers good graphics, a very wid.. This game is one of the best games I have ever played! Even if it's an older game and I have a lot..
Mario Kart DS Review Mario Kart DS provides an amazing single and multiplayer experience. It has .. There is nothing that could be improved on this game. 10 out of 10! With 32 possible courses hal..
Hello,welcome to the number 10th ranked team (member wise)..
How do you powerslide turbo boosts? ..
Where do I enter cheat codes? How do i unlock R.O.B With Action Re..
~Official Character and Kart combina..